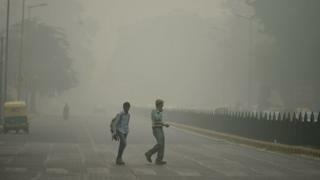 India's capital is enacting a plan to combat hazardous smog, as air pollution in Delhi hits "very severe" levels. The plan, which includes traffic restrictions and the shutdown of a major power plant, was announced after Delhi saw severe pollution last year. The plant contributed just 8% of the city's electric power but produced more than 80% of Delhi's particulate matter pollution from the energy sector. The panel has said it will also look at increasing the frequency of the city's metro trains and buses. Image caption Surging pollution levels last year led to a shortage of face masks in the city. Diesel generators are often utilised by private homeowners and businesses in an effort to combat Delhi's often erratic power supply.